A tropical look is easier to attain in northern climes because these tubers overwinter in gardens as cold as zone 6b when mulched. Part of the Tropi-cool Series, these new colocasias have proven themselves to be perennial, even where the soil freezes. They will please gardeners everywhere with their bold color and easy to handle sizes. Bikini-tini stands above the others, literally, growing 5 to 7 feet tall, the upward-facing bluish-gray leaves form cups that show off the dark purple petioles and veins. It’s a tetraploid, so it is also strong-stemmed and thick-leaved. For a fun game when it rains., watch the cups of Bikini-tini fill with water, and then tip to pour it out! Children will love this. 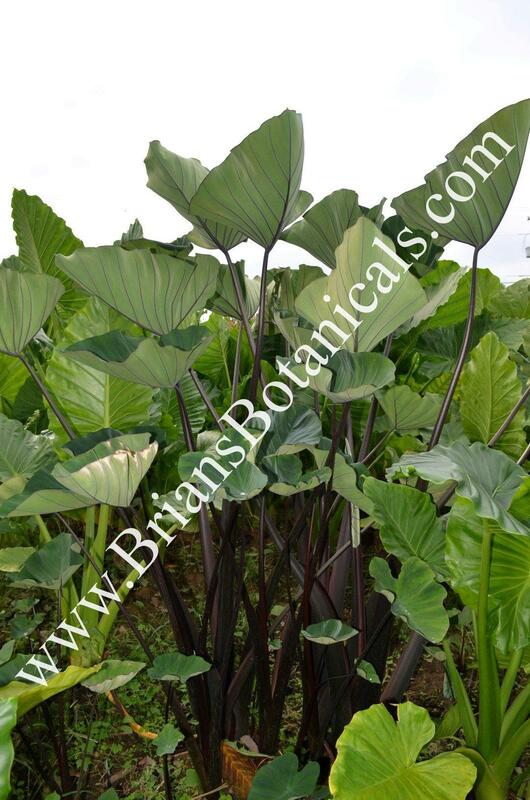 This huge growing cupped up leave Colocasia can get over 6 feet to 7 feet tall with very large leaves and dark under-veins. Hardier than most and producing nice tubers. I have over wintered this plant for many years in zone 6 Kentucky with mulch protection 6 to 8 inches. A tough and reliable plant. Great for gardens and ponds.